Legend at Arrowhead Golf Club is a traditional player friendly layout. Designed by Arnold Palmer, this course features a tropical style layout. Wide, expansive fairways lined with numerous mature Palm trees make this a great course for beginning golfers. The more experienced golfer will enjoy the multiple lakes and undulated greens. 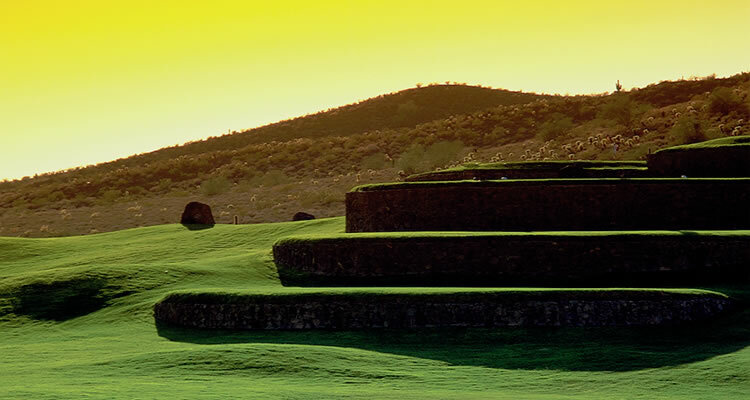 The course sways gently through subtly desert brushed lava hills. Long winding bunkers slope down the greens adding to the surprise. A choice of four different tee placements makes this course fun for any level of player. The signature hole, #5 offers elevated tee steps where some of the best Kodak moments reside. Be sure to take your camera! From Phoenix Sky Harbor: Follow signs for the I-10 W. Merge onto I-10 W. and continue 5 miles. Merge onto I-17 N. via exit 143A towards Flagstaff and continue 14.3 miles. Take the Loop 101 W. exit via exit #214C and continue 4 miles. Exit 67th Ave via exit #18 and turn right. Turn right onto W. Legend Blvd. Course is located straight ahead.